To explore the different activities that women and men do each day and how these contribute to the local economy. The tool asks participants to think about all the activities they did the day before and maps this out on cards for participants to categorise. This includes activities such as cooking breakfast, collecting water, resting, working in the fields, selling goods at the market, or participating in a community meeting. Participants see that care for people and the environment is a critical part of the economy even if this is not paid work. Participants begin to discuss the division of labour between women and men and why some activities are more often done by women rather than men and vice versa. In a group discussion (can be in small groups), participants list ALL of the activities that they did yesterday. Participants draw, or write if they can, one activity per card. Men and women will be given different coloured cards – for instance, men may receive green cards while women receive yellow cards. The facilitator then asks, ‘Which of these activities helped you to take care of the natural resources that are around you? Participants then group these activities together and the facilitator places a card above these activities titled ‘Care for the environment’. The facilitator then asks, ‘Which of these activities are paid or generate income? Participants then group these activities together and the facilitator places a card above these titled ‘Paid work’. Participants then group these activities together and the facilitator places a card above these titled ‘social and cultural activities’. Participants then group these activities together and the facilitator places a card above these titled ‘rest and leisure’. Is there anything missing from this activities mapping? Does this activity mapping capture the main activities that you see in your community? Identify those activities that take up the most time for you. As women’s cards and men’s cards will be different colours it will be visually clear which activities men and women spend more time doing. What activities do men and women do that are the same? What activities do men and women do that are different and why? What activities do girls and boys participate in? How much time do women and men spend on different activities? Can both men and women do the care activities listed here? Are there activities that are done more by younger women? Are there activities that are done more by older women? How does the amount of money you have affect how much time you spend on care activities? Which of these activities do you do at the same time? differences between their activities. In most cases women and girls will be more involved in care work activities than men and boys. You will likely find that men have more time for paid work either as agricultural labourers, factory workers, traders etc. Many women will be involved in paid work and in unpaid work such as subsistence agriculture. Here facilitators want to show that women are involved in paid and unpaid work alongside unpaid care work. What is the value of the unpaid and care activities? How does that impact on how we see women’s and girls’ contribution to the economy/community? Age: Children and youth may have different activities than women and men as they may be in school rather than working. However, for some girls and young women their age may mean that they have to carry a heavier workload because of their low status in the household. For instance, young wives may not be able to ask their husbands to support them with their housework. Young women are also more likely to have younger children that require more care. Older women may also have to take on more care work, particularly in countries badly affected by HIV and AIDS. Status: Widows and single women will often have more work to do than other women unless they have support at home. Widows and single women are likely to be involved in paid work or subsistence agriculture to meet their basic needs while also having to do most, if not all, of the care work at home. Disability: People who are disabled or challenged physically and mentally and those who may be sick (due to old age or a disease) are often care responsibilities for other members of the household. This would imply increased unpaid care work for other household members and they may need to access community care and support. Class: Some people in the community will also be able to pay for care services and goods while others will not. For instance, richer community members might be able to pay for electricity or hire domestic workers in their households to help with the cooking and taking care of children. This will mean they spend less time on care work than poorer households. The process of using the activity mapping will support help participants think about and discuss power dynmics within the family, and appreciate the work that people do to care for people and the enviroment is a critical part of the economy, eve if it is unpaid. If the process is rigrously recorded across time or across communities, then the evidence can be used to answer research questions, and as part of and influencing or advocacy strategy. 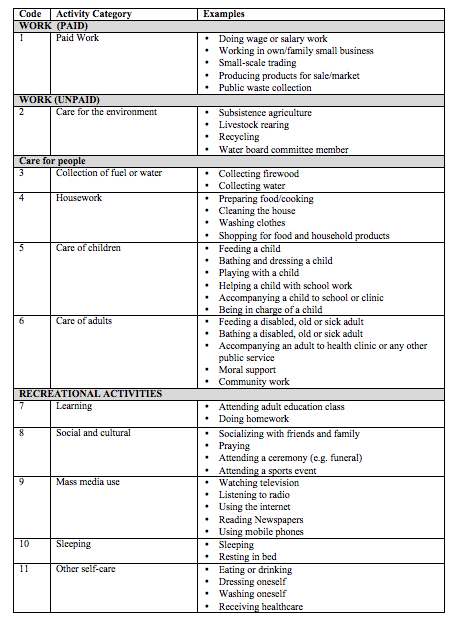 The table below shows an example of some of the different activities that might come up and how they could be categorised. The Activity mapping tool works very well in identifying and categorising the work done by women and men to enable people recognise how much women contribute to / do as unpaid care work. I would like to suggest that more guiding questions be listed to help the facilitators in leading the discussion on bringing about change. The focus would be on the 3Rs of addressing issues of unpaid care work i.e. Recognition, Redistribution and Reducing the burden. This is a tool that takes time. Happened to me often that lots of energy was spent on setting up the tool (cards, time for groups, etc.) and then little time (and energy) was left for analysis. A balance of both is ideal. And a nice alternative to time surveys! Yes that is true. This tool does help for the change we want.